Illustration from Jami's Rose Garden of the Pious, dated 1553. 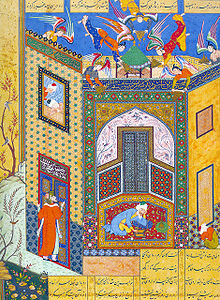 The image blends Persian poetry and Persian miniature into one, as is the norm for many works of Persian literature. ↑ 1.0 1.1 "Nour o-Din Abdorrahman Jami". Iran Chamber Society. Retrieved 2013-04-03. ↑ Losensky, Paul (23 June 2008). "JĀMI". Encyclopædia Iranica.